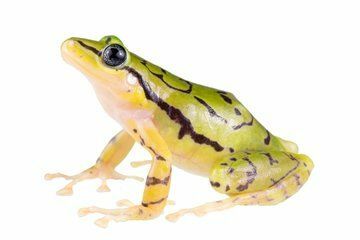 A yellow-green frog with eye-catching stripes that was discovered recently in Ecuador's cloud forests has now been deemed a new species of rain frog, according to a new study. Across the U.S. and Canada, there are about 110 described frog species. By comparison, Ecuador — which is about the size of Colorado — is home to 570 frog species, and counting, according to the researchers. The latest species discovery in Ecuador came from an expedition that focused on studying a similar, threatened frog called the ornate rain frog (Pristimantis ornatissimus). "[We] were characterizing the genetic differences among populations of the ornate rainfrog, which was thought to be a single species of frog until we uncovered one population that was strikingly different from all others and turned out to be a distinct species," co-author Chris Funk, a biologist at Colorado State University, said in a statement. The new rain frog species, named the Ecuadorian rain frog (Pristimantis ecuadorensis), is already considered "endangered" based on guidelines from the International Union for Conservation of Nature. An "endangered" classification means the recently discovered rain frog is at a very high risk of extinction in the wild. The researchers said the frog is at risk due to habitat loss within its already-small range. Small ranges are common in Ecuador, the researchers said, because the country has a large diversity of habitats and climates defined by the Andes mountain range. The new rain frog species, which was determined via DNA sequencing, makes its home in the Las Pampas region of the western Ecuadorian Andes, the scientists said in the study. "We know that there's lots of undescribed biodiversity in Ecuador, so you could think this discovery is not a big deal," said study lead author Juan Guayasamin, a professor at Universidad San Francisco de Quito. "But this species, first of all, is spectacular-looking; secondly, it's restricted to a very small area, which once again emphasizes range-restricted, highly threatened biodiversity in the tropics. And lastly, its name ­— the Ecuadorean rain frog — will hopefully draw local and international attention to the endangered species and ecosystems of Ecuador." The researchers chose the rain frog's name specifically to honor the country's beauty, culture and diversity, they said. The new species is described in a paper published online March 22 in the journal PLOS ONE.